Conflict is not new to mankind, of course, but the communication systems of our modern world allow us to be acutely aware of its pervasiveness. Like the rest of the world, Rotarians may not agree about the solutions to all the issues related to the kinds of conflicts we face today. In fact, right here in our own Rotary District 5495 we have differing opinions about how to deal with every type of conflict. However, as Rotarians we do understand and agree on the value of conflict prevention and reduction. Through our community and global projects, we provide critical skills and resources that equip vulnerable populations with tools for managing many of the root causes of conflict and stress. Our own clubs demonstrate our commitment to peace when we provide conflict resolution training to our local school children. Or when we participate in a global grant that leads to a new source of water, thus ending decades of feuding for scarce resources and building a new future of inter-group collaboration. Some clubs support women and children fleeing domestic violence and in need of shelter, job training and a new beginning. The list of examples is endless and it is inspiring. ONE THING your club can do at no cost to your club is spread the word about fully-funded Rotary Peace Fellowships, ensuring that a future cadre of individuals receives advanced training in peace. Peace Fellows come from a variety of professions and backgrounds. Sources for candidates include your network of friends, coworkers, and professional providers, as well as members of the community in general. Applications must be submitted by May 31st, so time is of the essence. 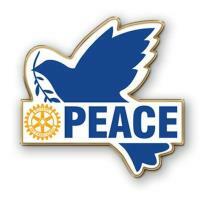 As we Rotarians hear endless news reports of violence in our local communities and throughout the world, we can be comforted by the knowledge that we have chosen to do our own part by providing peace through our service.